The Eduard write-up of this aircraft concisely sums up the history of one of the Luftwaffe's most successful fighter designs: "The second half of the Second World War saw the Focke Wulf Fw 190, in its various forms, emerge as the best of what was available to the Luftwaffe. The dedicated fighter version was a high performance, heavily armed machine. 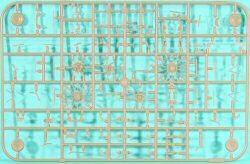 Its development had a precarious beginning, against a 1938 specification issued by the Technishes Amt, RLM. The first prototype took to the air on June 1, 1939. After a series of improvements and even radical changes, the design culminated in the fall of 1940 into the pre-series version Fw 190A-0 to the tune of twenty-eight pieces. Six of these were retained by the test unit Erprobungsstaffel 190 at Rechlin, which was tasked with conducting service trials. These revealed a wide range of flaws to the point where the RLM halted further development. Despite this, on the basis of the urgings from the test unit staff, the aircraft was not shelved. After a series of some fifty modifications, the RLM gave the go ahead for the Fw 190 to be taken into the inventory of the Luftwaffe. In June 1941, the Luftwaffe accepted the first of 100 ordered Fw 190A-1s, armed with four 7.9mm MG17s. By September 1941, II/JG 26 was completely equipped with the type, operating on the Western Front. November saw the production of the next version Fw 190A-2, powered by a BMW 801C-2, and armed with two 7.9mm MG17s and two MG151s of 20mm caliber in the wings. Part of this series received an additional two MG FFs, thus attaining an armament standard of later types. A significant enhancement to the design came in the spring of 1942, when the BMW 801D-2 became available, who's installation gave birth to the Fw 190A-3. July saw the development of the A-4. Both were armed with what became the standard two fuselage mounted MG17s, two wing mounted MG151 cannon, and two MG FF cannon, placed inboard of the wheel wells. During 1942, production had intensified, and a production facility was set up under license at Fieseler. Thanks in part to this, production rose in 1942 to 1,878 as opposed to 224 in 1941. Large-scale production of the A-5 was initiated in April, 1943, with an identical wing to the A-4, but with a nose extension that would become standard on all subsequent Fw 190A versions up through the A-9, and all corresponding F types. July saw the development of a new, strengthened wing, which incorporated MG151s instead of MG FFs in the outer position. The adoption of this wing developed the A-6 version. Further changes developed the A-7, produced during the end of 1943. This version came about with the replacement of the fuselage-mounted MG17s with 13mm MG131s. 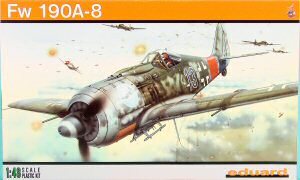 Further improvements led to the Fw 190A-8, and this version became the most widely produced with some 1,400 units made. The most significant change to this variant was the installation of the GM-1 nitrous-oxide injection system, for temporary power boost in combat. A portion of A-8 production was built as the A-8/R2 and A-8/R8, armed with Mk108 cannon in the outer wing location, and with armored slabs added to the cockpit sides and a modified canopy. The final production version of the BMW 801 powered fighter was the Fw 190A-9, equipped with the BMW 801TS of 2000 hp (1470kW). There was a parallel development of these fighter optimized aircraft with a dedicated fighter-bomber version, the Fw 190F. These aircraft has reduced wing armament to two MG151 cannon in the wingroot position. The engine was optimized for low-level operation, and the armament options varied to satisfy the ground attack role, including bombs of various weight classes and a variety of anti-tank rockets. This branched into the extended range Fw 190G version. Development of the thoroughbred fighter continued in the guise of the Fw 190D, which began to reach Luftwaffe units in the second half of 1944, and was the result of mounting an in-line Jumo 213A-1 engine into a modified Fw 190A-8 airframe. Although the Fw 190 never achieved the widespread usage of the competing Bf 109, its contribution to the German Air Force was certainly significant through the second half of WWII. 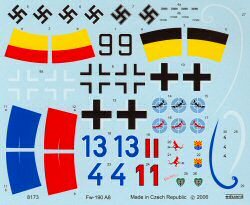 Fw 190s saw service on the Western Front as well as the East. As heavy fighters with imposing firepower, they found themselves integral components, from 1943 onwards, within the units tasked with the protection of the Reich from the ominous clouds of allied four-engined bombers. This is where the A-8 version was instrumental, along with the A-8/R2 armoured development. This version, with its firepower, was a very ominous and daunting foe for the bomber crews. From the second half of 1944, their danger was kept in check to a degree by escorting P-47s, and necessitated the development of the P-51 Mustang." I was pleasantly surprised to have a package arrive from the Czech Republic today. 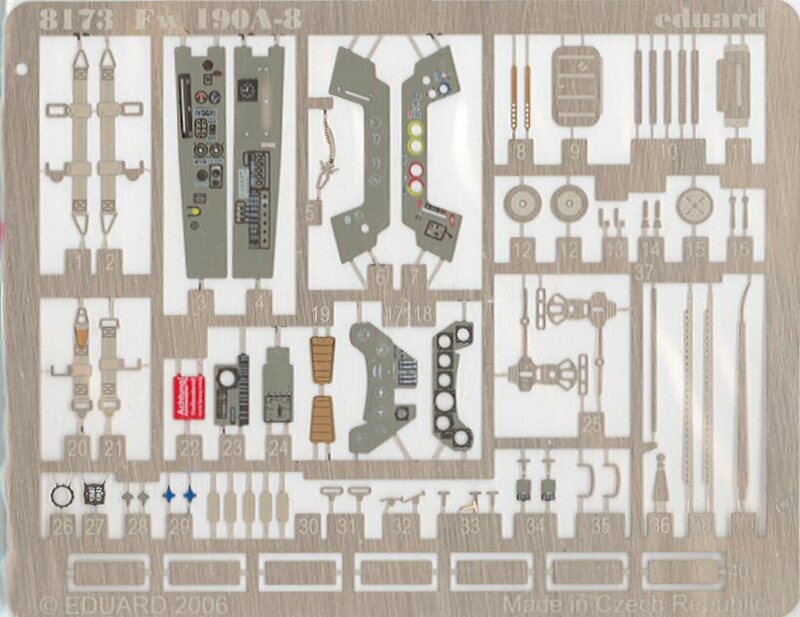 The upcoming Eduard 1/48 Fw 190A-8 had arrived. Eduard was kind enough to send one of its test shots for you to see along with some release notes. 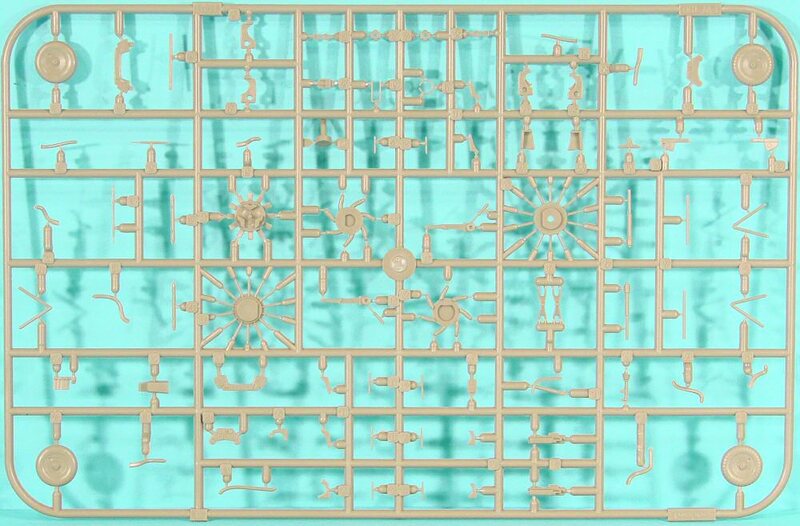 This kit is molded in brownish-gray styrene and presented on seven parts trees, plus an additional tree of clear parts. 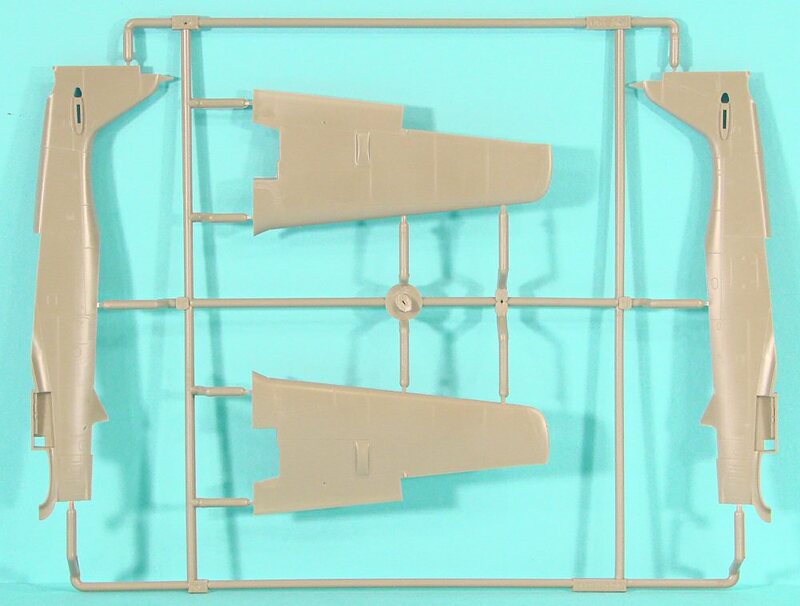 To put that into context, the Tamiya 1/48 Fw 190A-3 kit only has three parts trees and a clear tree. 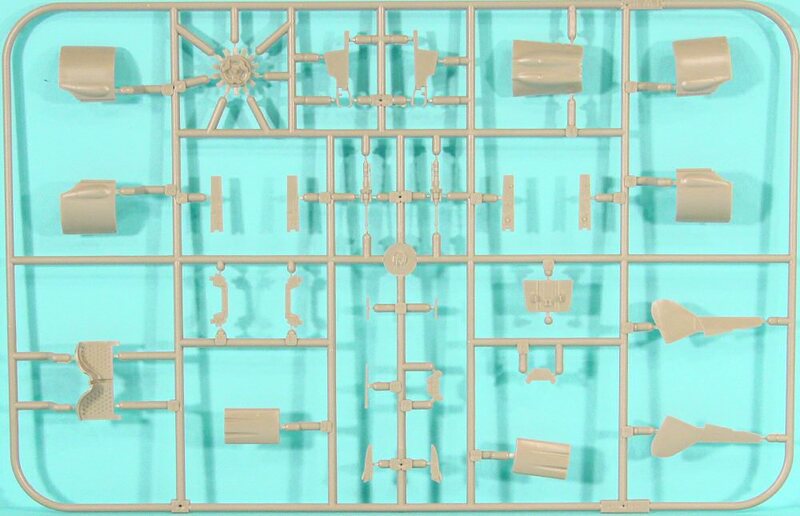 Each of the three Tamiya parts trees are only 2/3 the size of the Eduard trees. 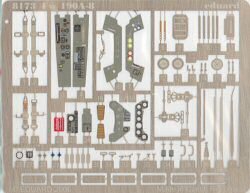 In other words, the Eduard kit provides quite a bit more detail than Tamiya. 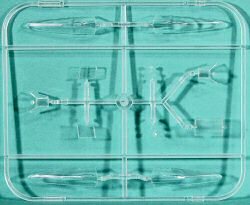 By definition, the kit comes with a set of Eduard photo-etch, and this kit features the new color printing process with lots of details printed in color right on the parts. 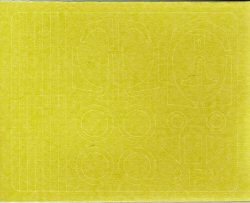 NOTE: You'll see on the test-shot's photo-etch that they used the wrong gray in the printing process, the release notes say that RLM 66 will be used on the production parts. 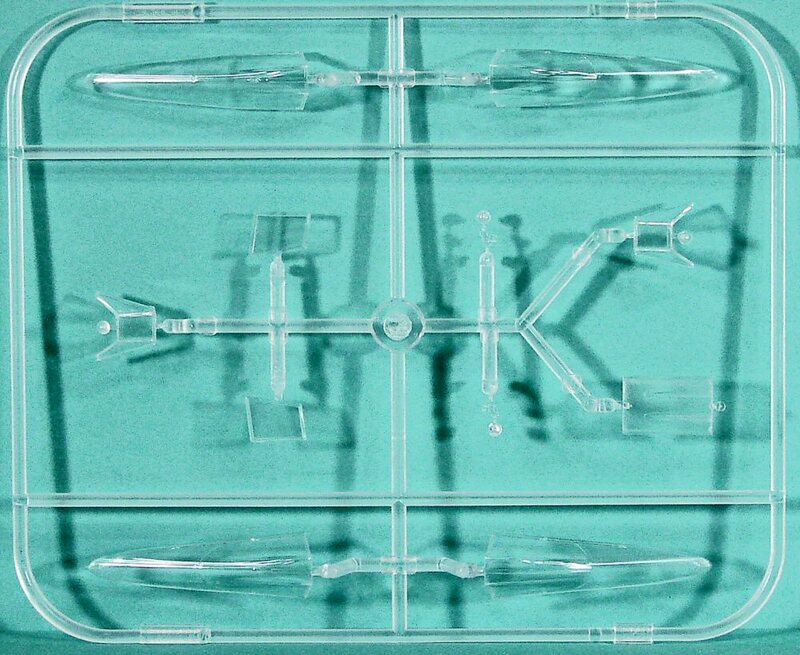 The kit is designed with modelers of all skill levels in mind. 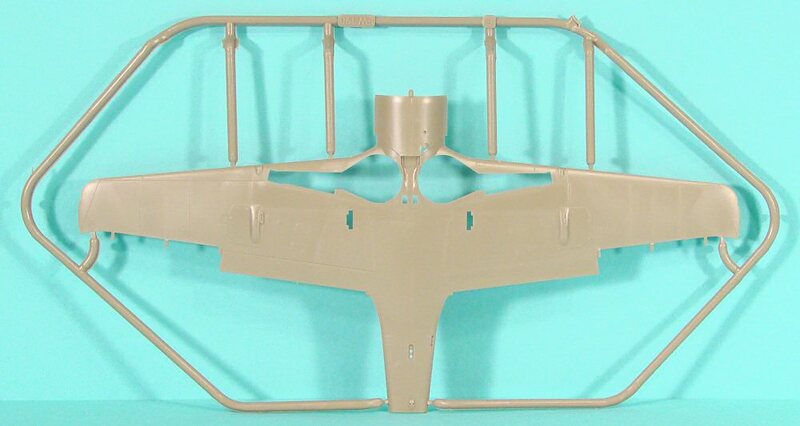 For example, the cockpit side consoles have details pre-molded in place, or you can remove the detail and use the color photo-etched parts instead. The choice is up to you and your comfort level. Another example - the rudder pedals. These are provided in styrene and photo-etch, your choice. 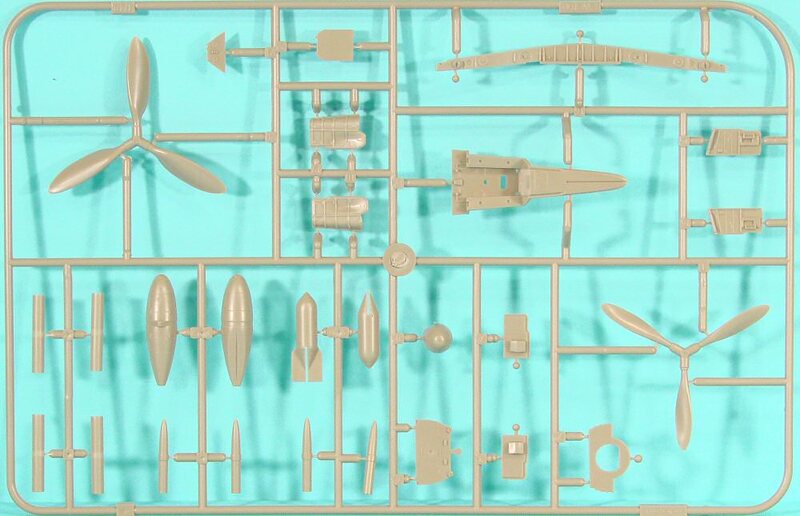 In other words, you don't need the photo-etched parts to complete this kit if you don't want to use them. Nice touch. The main gear struts are molded to be fool-proof for getting the right 8 degree angle offset of the main wheels to the strut and for getting the struts positioned properly on the wings. I'm looking forward to see how that works! 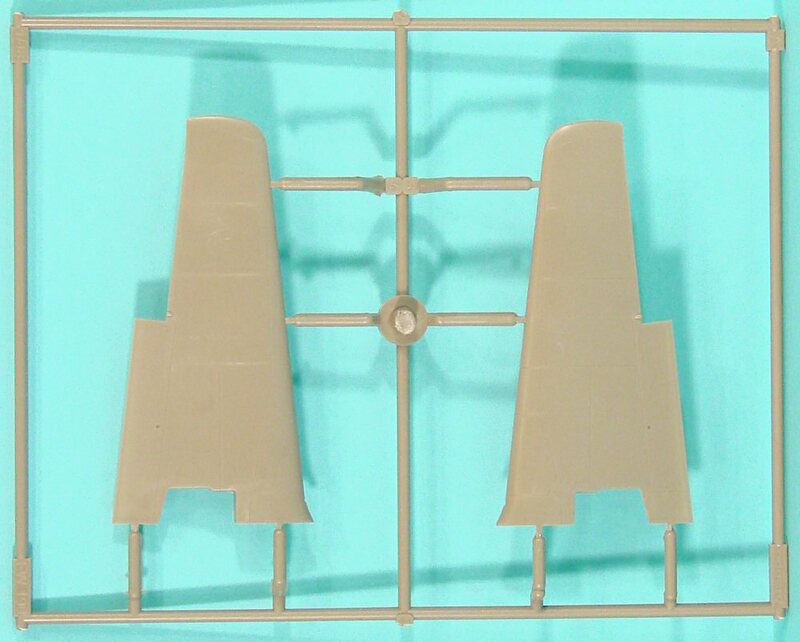 The ailerons and rudder are separately molded and positionable, but the elevators are molded in place. You'll have to do some surgery to position these. 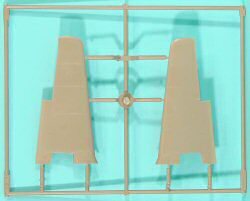 The landing flaps are also molded up, but while the instructions don't mention this, there are some details molded into the inside of the flap wells in the upper wing halves and cut lines are molded into the lower wing to make flap removal simple. I suspect that the Royal Class will offer photo-etched flaps with all of the details in the future. One comment on Eduard's packaging. Some of the parts trees are individually bagged while others are two-trees-per-bag. In the latter case, the engineering of this solution is elegantly simple. 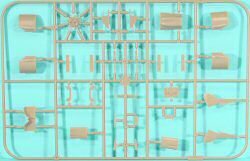 When two trees are designed to be bagged together, one receives four-to-six pins molded on the frame that plug into four-to-six holes molded into the other frame. The two trees are locked together so they won't rub together during shipping and damage smaller parts whilst inside the bags. Simply brilliant! 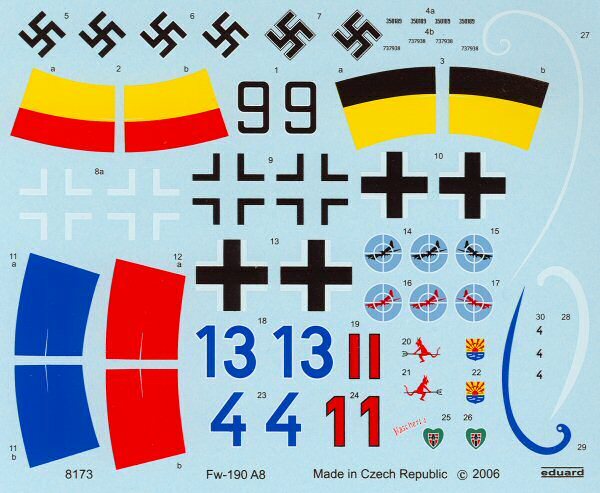 Two sheets of decals are provided, one for the distinctive unit markings and national markings, the other with a VERY complete set of maintenance stenciling. 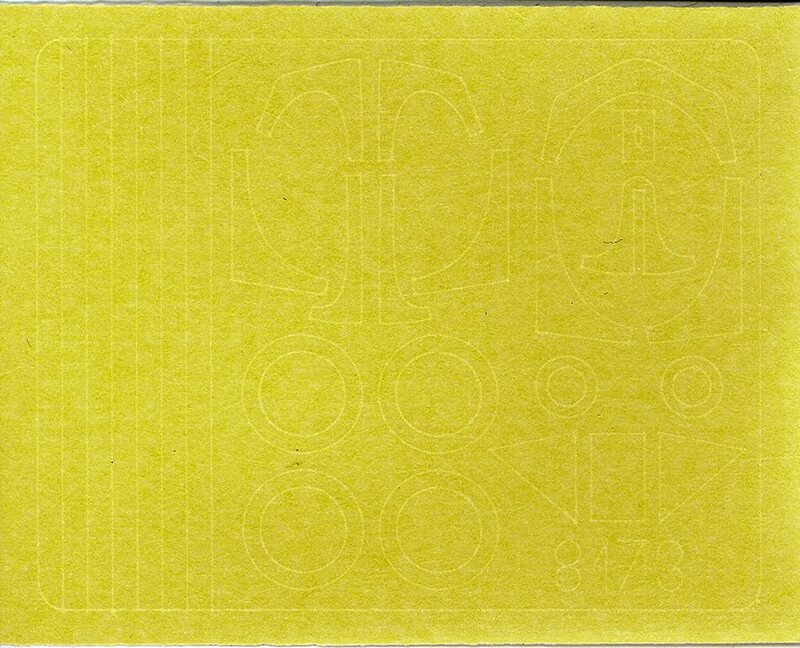 You can also see a sheet of the new yellow-tape masks included as well. 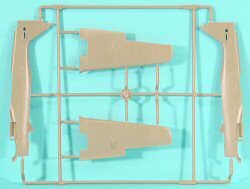 These are being redesigned for the final release to also provide masks for the wing root gun bays. 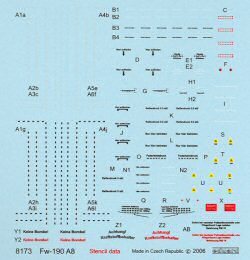 According to the parts map at the beginning of the instructions, only 16 parts are not used in this kit at all. 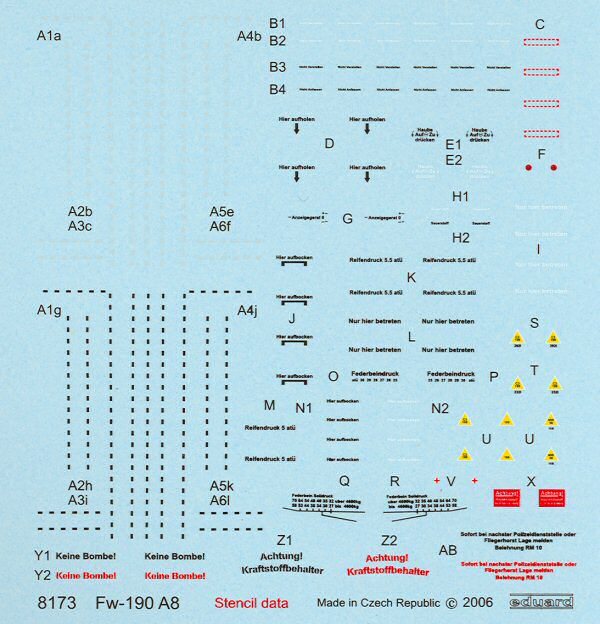 There are others that are optional to the variant you're building, but this kit does not scrimp on detail!